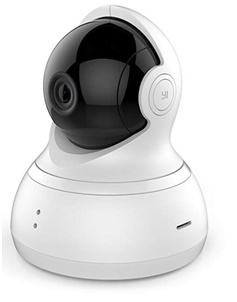 YI Dome 720p Pan/Tilt/Zoom Wireless Indoor IP Camera enables you to check-in with your family through 2-way audio or see what your children or grandma is up to by connecting to its live video. Its 720p High-definition, 112° wide-angle advanced glass lens combined with 345° horizontal and 115° vertical rotation range create a complete 360° coverage. This YI Dome camera contains comprehensive next-level infrared lights (8 built-in 940nm SMD infrared lights) for more subtlety, environmentally friendliness, and so even zero light environments can present a clear picture. Night vision has a range of up to 5 meters. Using YI's original tracking algorithm, YI Dome camera automatically tracks and captures the movement of an object after detecting motion. Additionally, the users is immediately sent a 6-second alarm video. In addition, YI Dome camera can provide high-quality low-latency two-way voice. Its embedded high sensitivity microphone and high-fidelity speakers remain true to the human voice coupled with an optimization algorithm effectively filters out any ambient noise. By using the "YI Home Camera" app (Android and iOS supported), your family can communicate as if using a phone. This camera does not come with a memory card but you can additionally purchase the supported 4G~32G microSD cards. When the memory card is full, it will automatically overwrite the oldest recorded video. If not, you can leverage YI Cloud that offers loop-recording with no storage limit, so even if your YI camera is stolen or damaged, your footage will still be secure and accessible on the cloud. The other interesting feature is auto-cruise feature (360° panoramic or preset mode), which is the automatic movement according to pre-set automatic patrol paths even when no one is in control of the camera. This way, you won't miss any traces of clues. if you are interested check out more about this camera here! This camera is amazing! I do not care about the "privacy terms" that you have to accept on the app, I get to check on my Year and a half old dog who just started having seizures last week. I can be at work, turn the camera on using my iPad, and work away keeping tabs on her. If she has a seizure, I will be able to see it, leave work for a bit and care for her. My mind and heart are at ease because of this camera. I originally got this camera to keep an eye on my puppy while I was away at work, but now I use it to see who's at my front door. I love that I can control the camera from the app and it has a 360 view. You can set the camera sensitivity to the type of alerts you want to receive, however, the alerts are delayed sometimes by seconds, and sometimes several minutes. Also, the camera seems to go offline randomly a few times a month and I have to reset it. This is my second YI camera. One is the 1040 version the second is this 720 version. I am quite impressed with both. Looking at the view on my phone I can't see any real difference. Looking at it on an Ipad this camera seems slightly brighter with a little larger field of view than the 1040 model. I am extremely happy with both camera's. I haven't used the sound except to test but it seems to work well. The picture using the Ipad is outstanding from both cameras and adequate on my Samsung Note 8. The only improvement I can think of is if you could look at both cameras at the same time. That might even be possible but I haven't found how. I've had 4 of these cameras for several months now. For the money, they are ok. Without signing up for the monthly service, they only record a short (6sec) video. They have failed to pick up activity, my husband left for work, and I never got an alert. Or someone goes in a room and that camera will alert, but another focused on the doorway, never alerted. Alerts will either come through quickly, or take minutes, hours to come through, leaves me uncertain what's happening. I can erase all alerts and camera is off but app still says there are alerts. They are somewhat unpredictable as to whether they will pick up the activity and/or send an alert. I emailed customer support with some of my questions and they were less than helpful to say the least. Good introductory cameras if you just want to check on pets, would not recommend if you are having serious security issues and want a trustworthy camera system. Return to top of "YI Dome 720p Pan/Tilt/Zoom Wireless Indoor IP Camera"! !